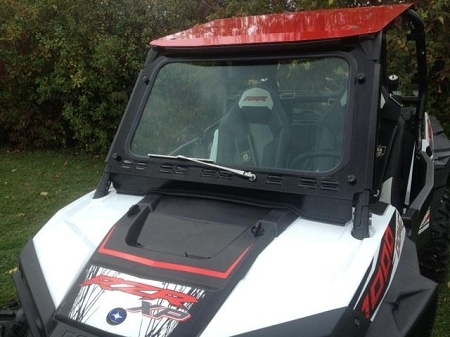 Description RZR Laminated Safety Glass Windshield Fits: 2014-16 RZR XP1000,2014-2016 XP1000-4, 2016 RZR 900-S and 2015-16 RZR 900 Louvers along the bottom to help prevent the vacuum created with most other full windshields. Laminated safety glass. Powder coated metal frame. Hand operated windshield wiper (Note: Actual wiper may vary from the picture) Quick connect mounting clamps. Made in the USA. Laser cut EMP logo plate included. Ships UPS and Packaged in Foam (see picture). 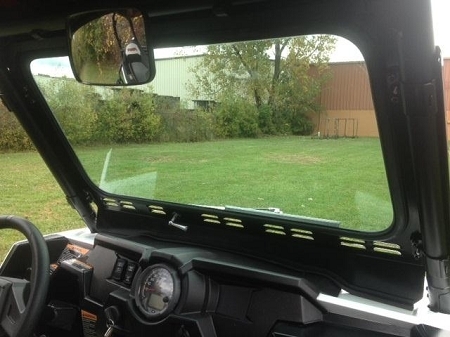 This is a great windshield for the RZR XP1000. 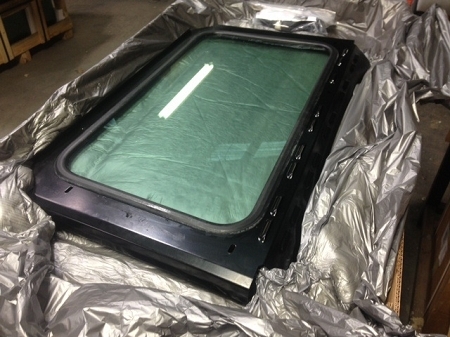 The glass is laminated safety glass, the same as many automotive windshields. The powder coated metal frame is made from 14 gauge steel. The side edges are not only bent, they are hemmed over to make a smooth edge to the touch. The windshield wiper is hand operated from either the driver or passenger seat. It will fit with the factory top pictured and many other aftermarket tops. The louvers along the bottom let is just enough airflow to help prevent a vacuum while keeping the wind off of you. Also, as with most EMP windshields it comes with our "Quick Connect Windshield Clamps" so removing your windshield is as simple as removing six thumbscrews. NOTE: The exact wiper may vary depending on the hand operated wipers that we have in stock at time of shipment. We use two different manufactures based on availability. We reserve the right to make modifications/improvements to our products at any time. Vehicles may have changes throughout the year. Therefore, pictures are a representation of the product you will be getting but may vary due to product revisions.